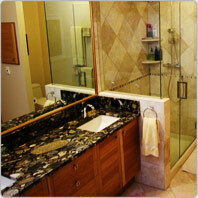 Our featured project illustrates the problem areas of a 1980’s master bathroom. The design approach included functional and aesthetic opportunities available without adding square footage. Welcome to the JR Construction Corporation web site! JR Construction Corporation is a “design / build” custom home builder and remodel contractor serving west Denver, the Foothills west of Denver, Golden, and the I-70 West corridor including Genesee and Lookout Mountain, Bergen Park and Evergreen. We invite you to visit the site pertinent to your construction needs. JR Construction Corp incorporates a "balanced aproach" to design and construction projects. JR Construction Corporation is well known for its attention to detail, quality, and delivering a final product in a timely fashion meeting and exceeding expectations of the homeowner.